Just got an email that Matt has released a newer smaller ultimate bluegill called the Mattlures U2 Gill. These baits look incredible and come in two versions, a sinker and a floater. 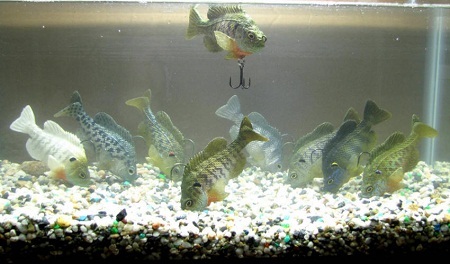 The picture of the baits in the fish tank is awesome. If that blue gill suspends like that I can just imagine the blowups that you can get from it. I was reading the description on the Mattlures website and it states that if a bass is to knock the bait over that it will stand right back up. You think that will irritate a bass? Probably! The baits are 4 inches long and weigh one ounce so no special equipment is needed to throw them. Check them out on Mattlures website. Photos are courtesy of the Mattlures website. 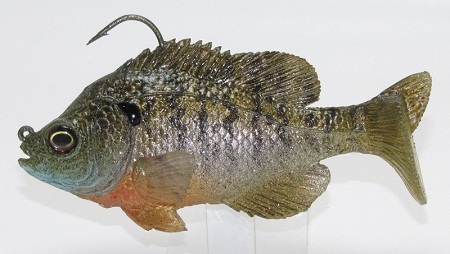 Check out the detail on that bluegill.